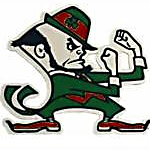 Irish Senior Colten Nelson broke SHA alum Bill Myler's career scoring record, but Logan Chilman's 26 points and a game-tying three-pointer in the closing seconds of regulation led the Aggies to the win. Nelson scored a school-record 43 points and moved closer to the Irish career scoring record. The Aggies' Logan Chilman led all scorers with 27 points while the Irish got 20 points from Colten Nelson. The Irish won the season opener led by Scout Nelson (19 points), who edged within five of 1,000 career points. Senior Michele Hubbard (14 kills) and junior Lauren Rookard (15 digs) led the Irish to the win over Northern Michigan Christian in three sets.